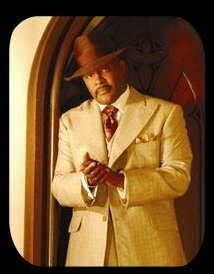 Pastor Marvin L. Winans. Legend, icon, pioneer. You take your pick, he's got the label. And he's sure to be on almost any Gospel artist's top three influencing artists. Everyone knows his voice, and his music is in everyone's collection, but how about the other side of the Pastor? The little pieces of information that you never knew. Sure, they're trivial, but that doesn't mean they aren't fun. Read on, as Pastor Marvin L. Winans lets us in a few tidbits that have never before been made known. It's the Insider Interview! What makes you upset? I take life as it comes. Disrespect is a big thing if you don't respect your parents and stuff like that. What food will you never eat? You don't have to worry about me eating alligator. We'd do better with what I would eat. I'm stuck on chicken, fish, beef, and pork. Outside of that, you won't hardly find me. I've tried duck and I don't have to revisit it. I don't do possum or squirrel and I want other people to stop. What character would you like to be on TV? It would have to be old TV because this new stuff, I don't even understand it. I would've been one of those lawyers. I like lawyers who break them down. What's your secret talent? If I have a talent, I won't let it be a secret. I put it all out there. There was a sign in high school that changed my life. The sign said, "Glory does not come from having talent. It comes from using it." If you were invisible for a day, what would you do? I'm sure there's some people I'd spy in on. I'm certain of that. But I don't know who. It depends on what's going on. Like OJ, what's wrong with you? I don't know what I would do, but I'd stay saved. Who's the most interesting person in Gospel Music? I don't know. They're all interesting. I'm stumped.